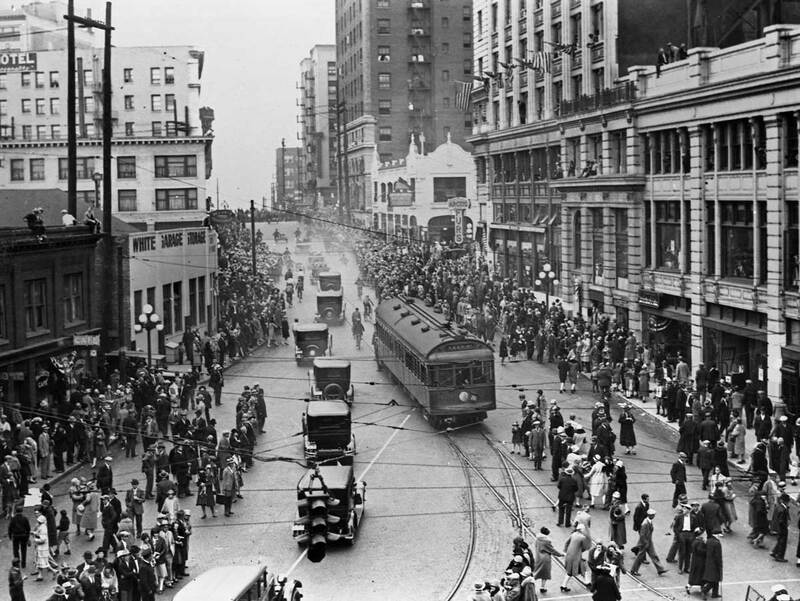 NOW: The Mayflower Hotel, rising here behind the stagecoach, opened in the summer of 1927. 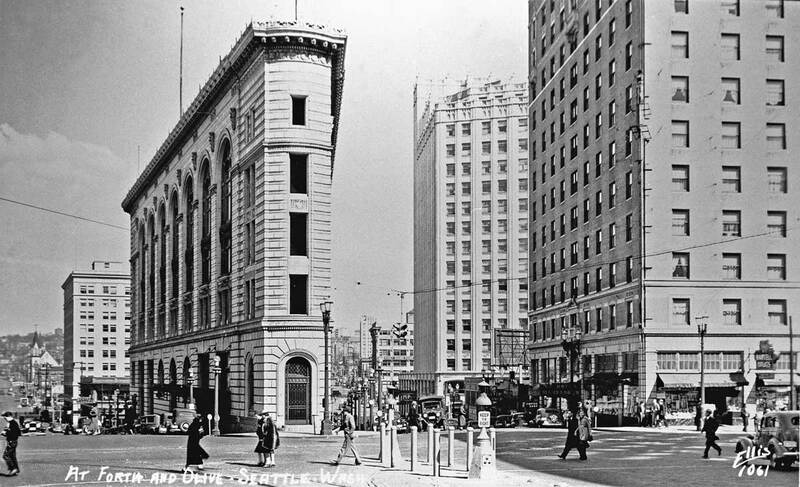 Across Olive Way, on the left, the stately Times Building was completed in 1916 and thankfully survives. 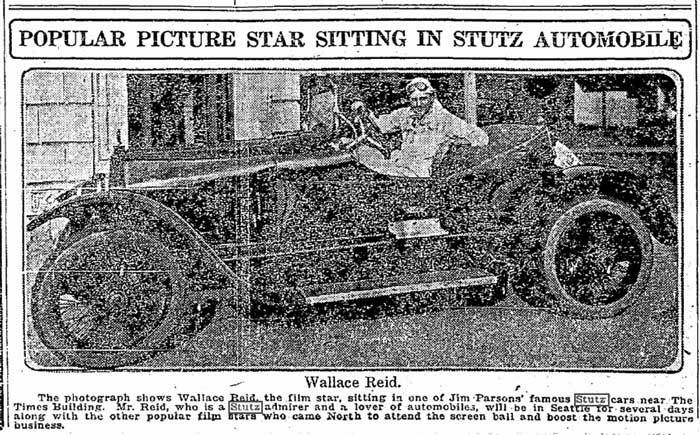 The editorial photo of actor Reid and his borrowed Stutz chosen by Times editors was not the one featured above, but rather the portrait of both printed at the bottom of this page from the July 20, 1919 Seattle Times. 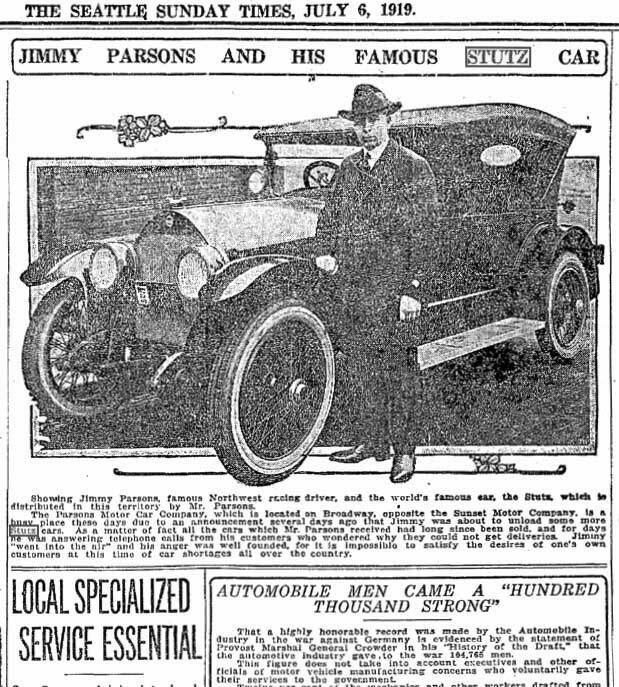 The source for Reid’s borrowed Stutz, Jimmy Parsons, both a Stutz racer and dealer. 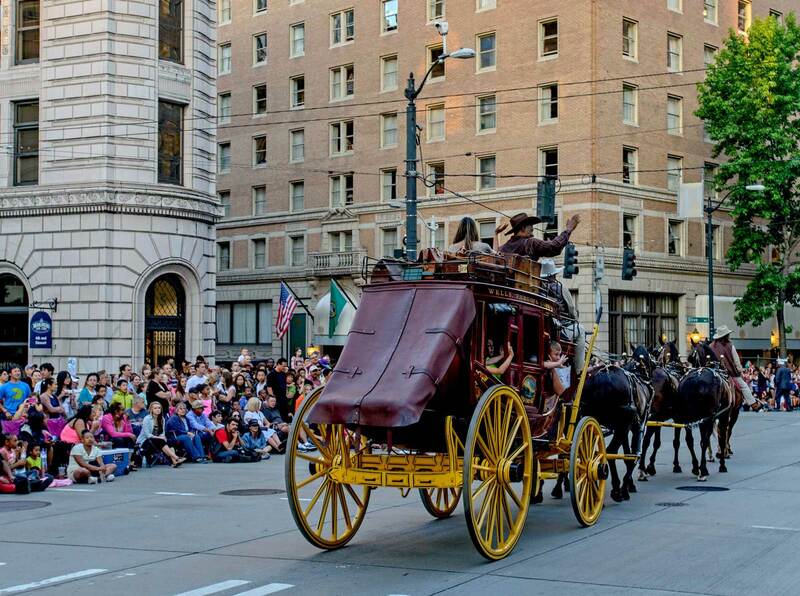 For his “now” Jean Sherrard considered asking the driver of the Seafair stage coach heading south on Fourth Avenue to pull on to the sidewalk and pause there for a pose, but the moving pressures of this year’s torchlight parade convinced Jean to record his “repeat” from afar – across Fourth. 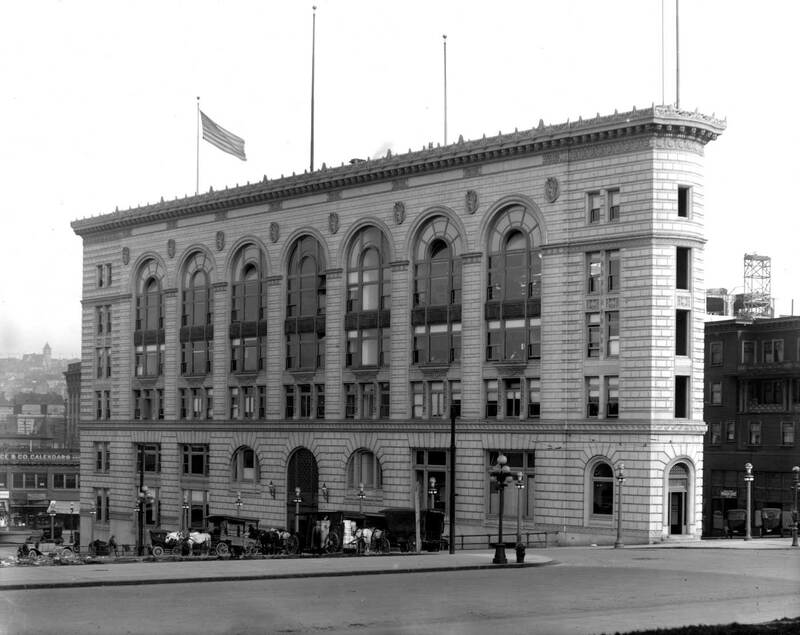 It is also a prospect that shows more of the architectural splendor of the Beau Arts Times Building, which was home for this newspaper from 1916, when the flatiron structure was built, until 1930 when the paper moved north a few blocks to its present plant in the Cascade neighborhood. 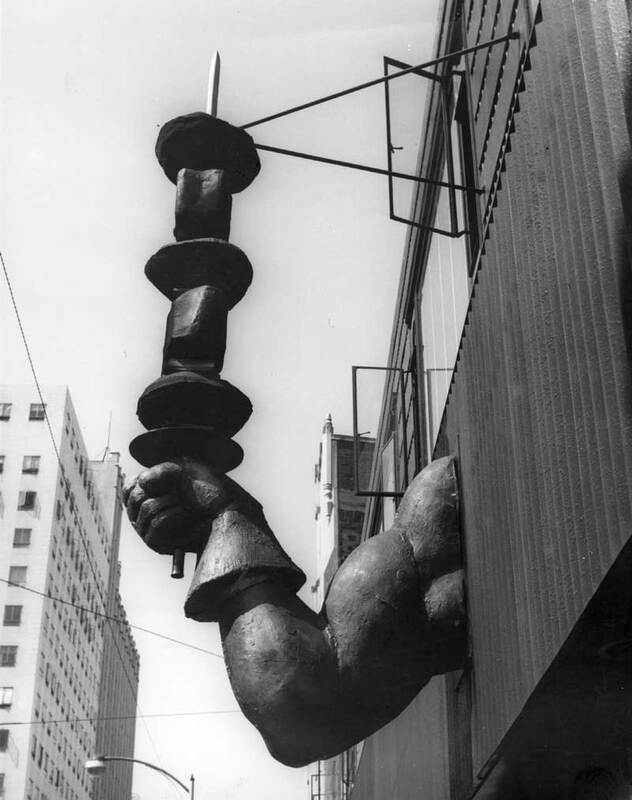 The Times building when nearly new. The flat-iron terra-cotta beauty is embraced by 5th Avenue to the east and Stewart and Olive, respectively to the north and south. 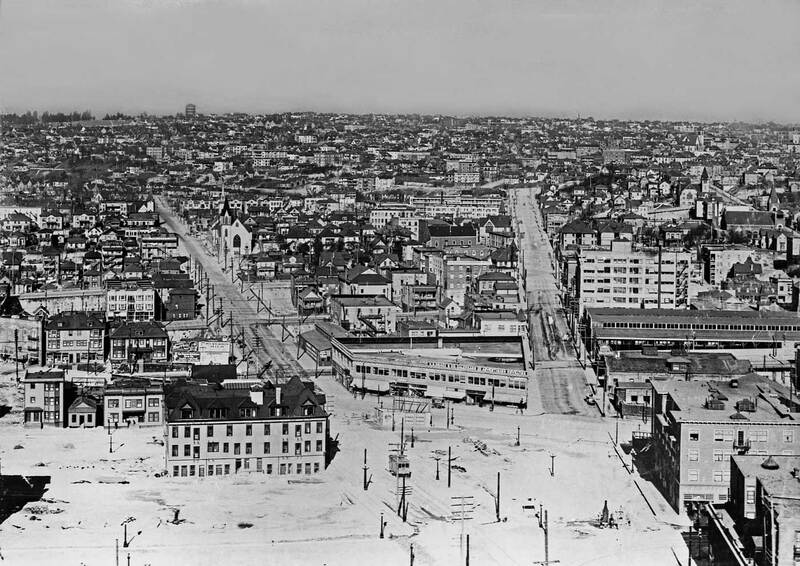 Across Olive, far right, the Waverly Hotel is still in place. Long-time “real photo postcard” artist Ellis looks east at the Times Square Building’s split between Stewart on the left and Olive on the right. Far right is the Mayflower Hotel. One may estimate the age of the undated photo with clues from its cars. Also in 1919 while doing his own stunt work for the production of The Valley of the Giants, in Southern Oregon, Reid was seriously injured. So that the filming could continue, the star was prescribed morphine for the pain. By the time of the film’s release on August 31, Reid had developed an addiction. While attempting recovery he died of pneumonia – and perhaps a failed heart as well – in a California sanitarium, on Jan. 18, 1923. He was 31 and left his wife, two children, and many films. 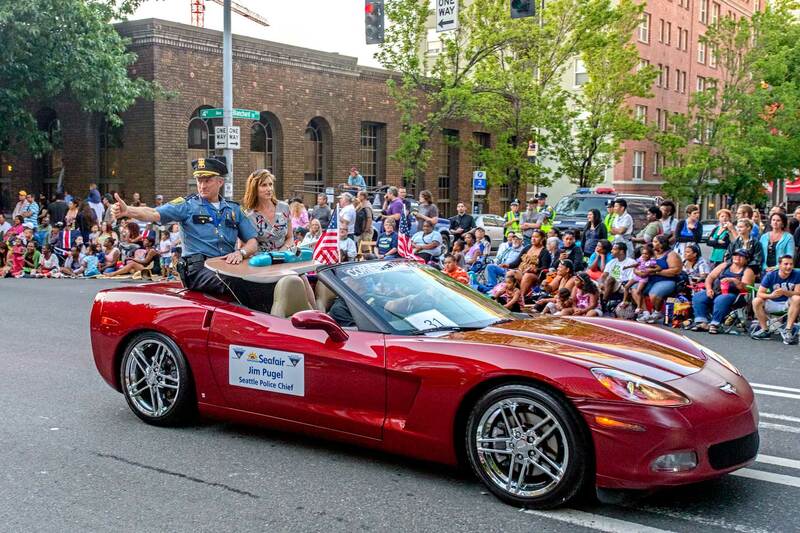 I have a few Seafair snaps I’ll drop in to provide extra spice. Anything to add, Paul? 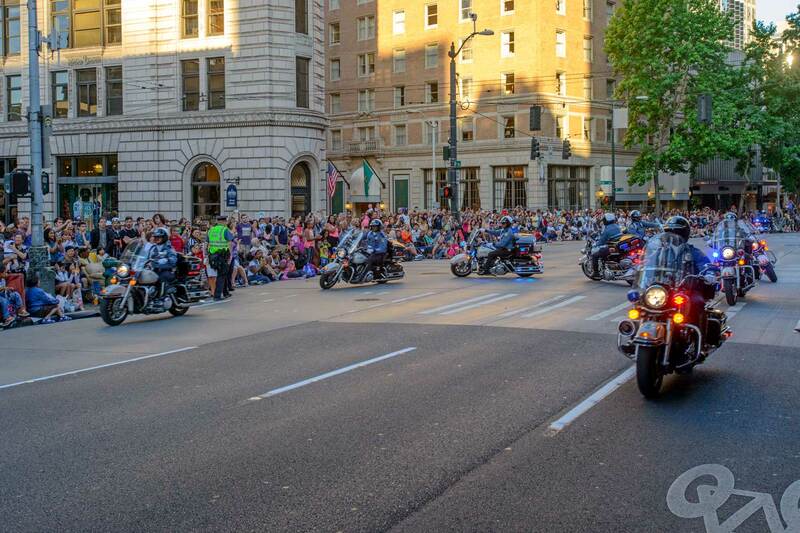 Only a sample of nearby subjects, including more parading, beginning with a Potlatch Parade scene from 1911, taken from the same corner, with the Waverly Hotel still in place and the Times offices still at the northeast corner of Second and Union. 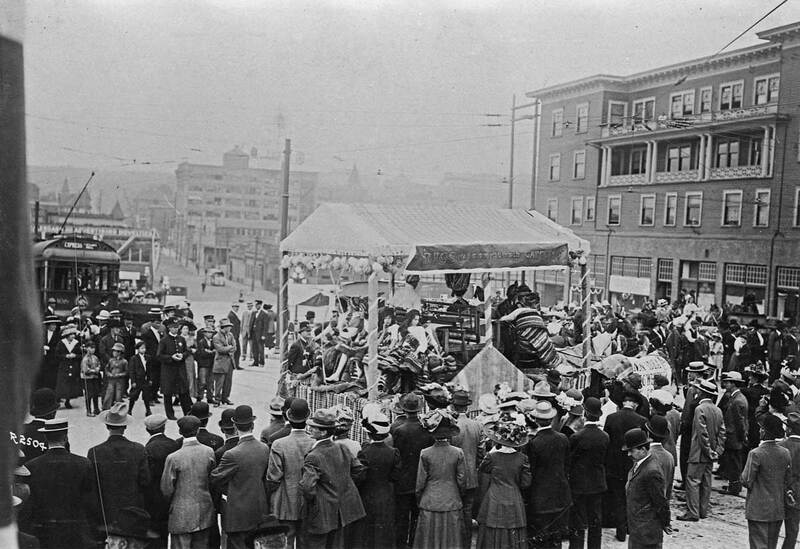 Looking east on Olive from Fourth Avenue during a 1911 Potlatch parade. 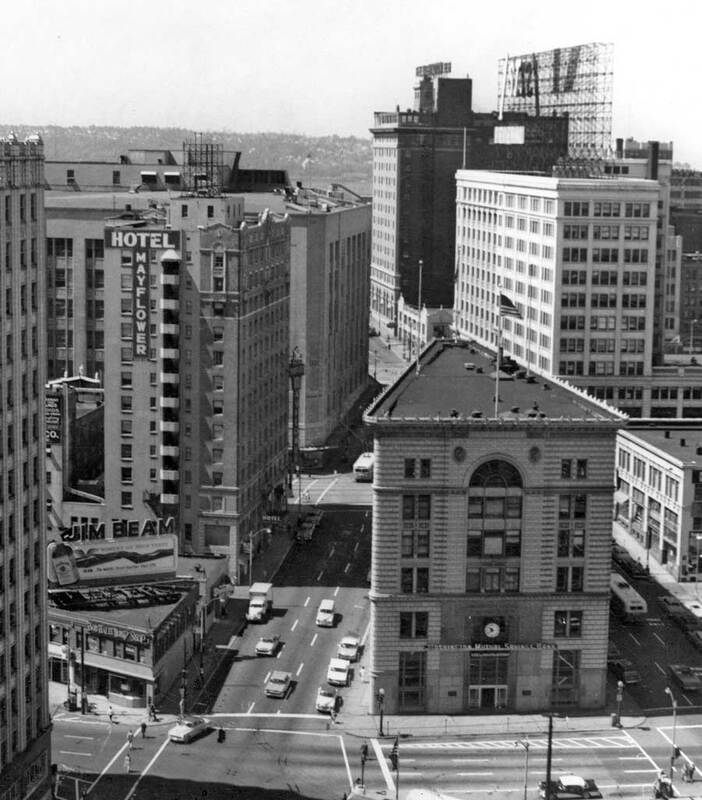 The Waverly Hotel is on the right – future home of the Mayflower Hotel. 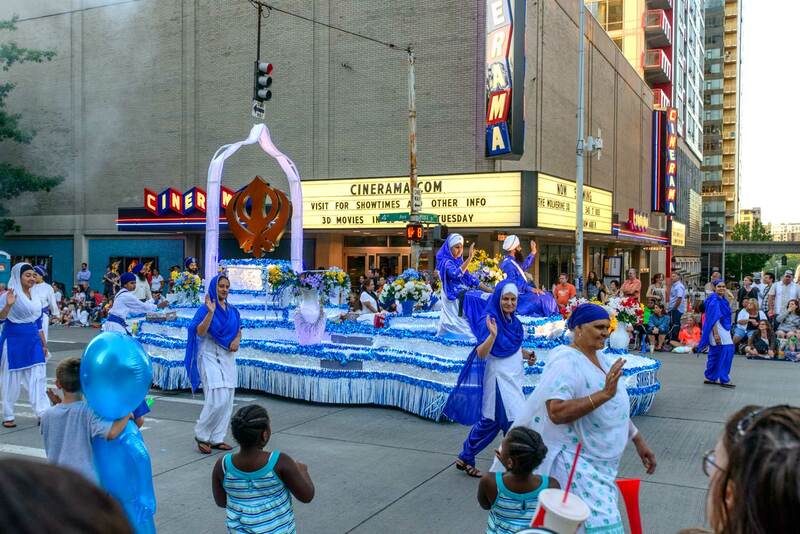 The float is promoting rugs. 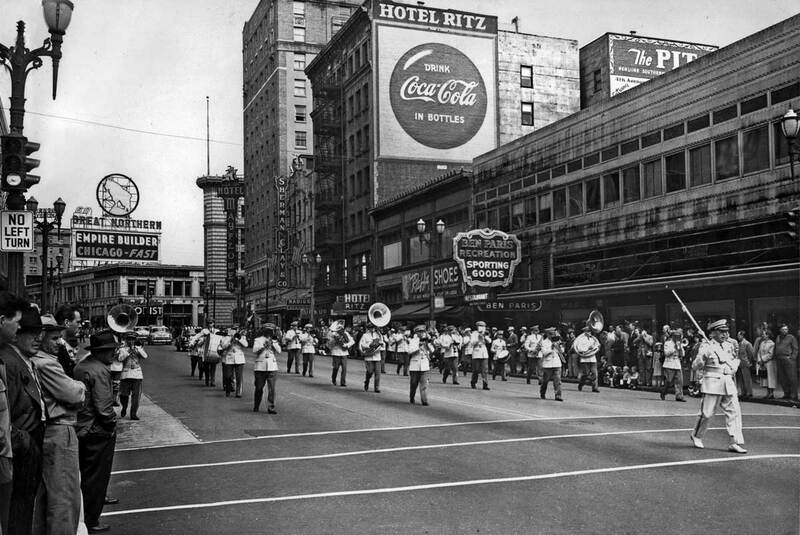 Next below is the same block on Olive in 1956. 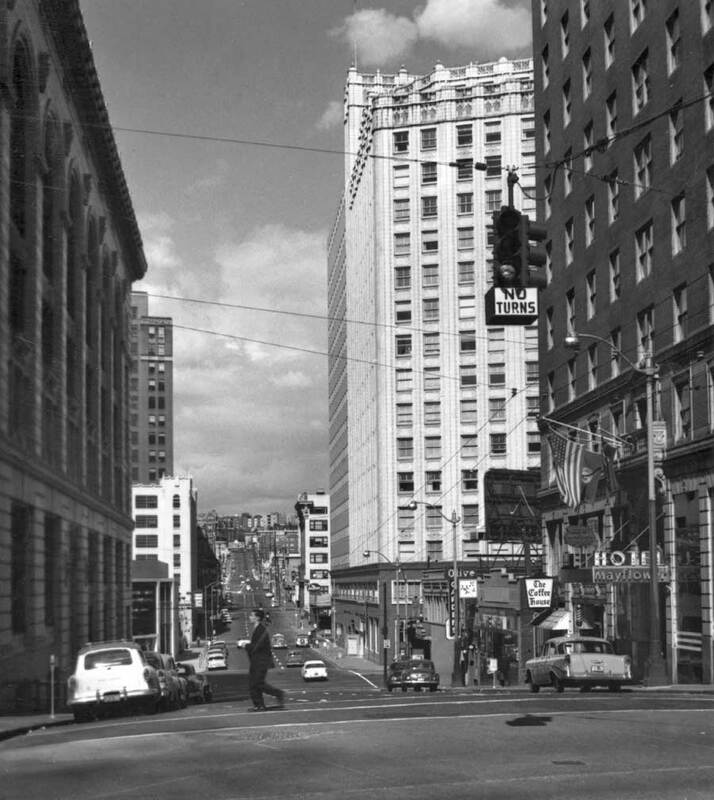 Looking east on Olive from 4th Avenue in 1956. The Mayflower Hotel is on the right and the Times Building on the left. By this time the newspaper had long since moved from this its 1916 plant to its 1930 plant on Fairview Ave. in the Cascade neighborhood, which is still the newspaper’s home. Looking west on Stewart from an upper floor of the Times’ Building. You may loosely hang a date – or nail it – from the automobiles and more. The flat-iron Times Building seen from an upper floor of the Securities Building at 3d and Stewart. The Mayflower Hotel is on the right, behind it the Medical Dental Building with Capitol Hill on the horizon. 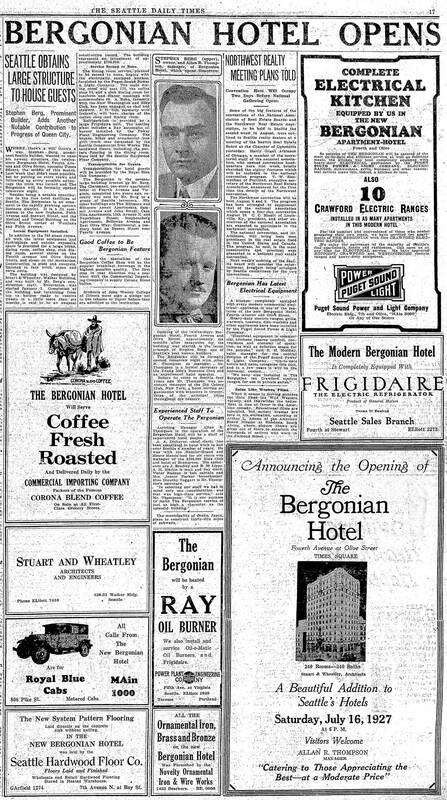 The Mayflower Hotel was first built fast and introduced as the Bergonian Hotel in 1927. 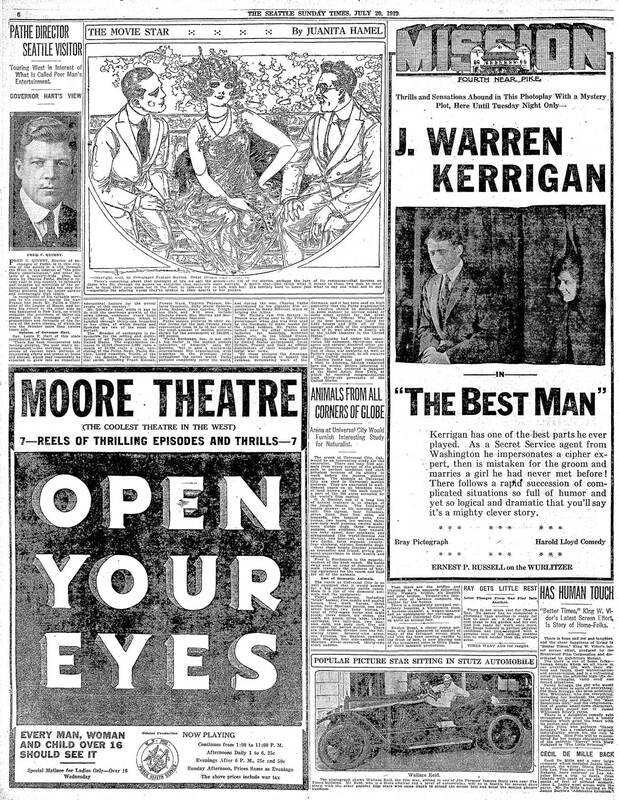 This nearly full-page age was clipped from The Seattle Times for July 15,1927. Roughly the same prospect as that immediately above. This one, of course, is earlier, and recorded from a new Washington Hotel (Josephinum) at the northeast corner of Stewart and 2nd Ave. This the southeast corner of Denny Hill has been graded and the triangular lot that will be home a few years hence for the Times is cleared. The Waverly Hotel is at the bottom-right corner. 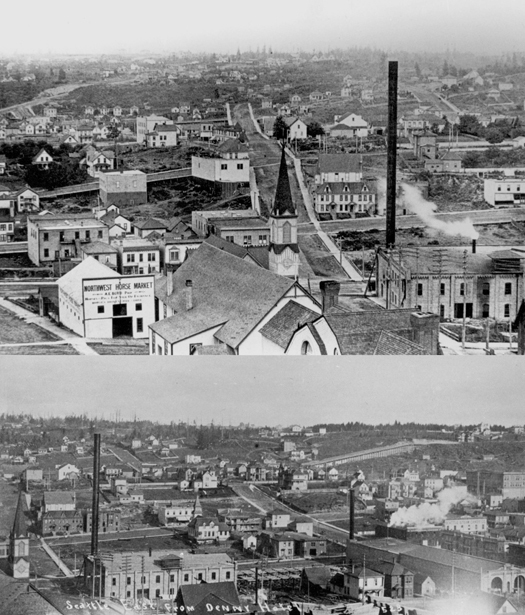 Two early looks thru the neighborhood east from Denny Hill when it was still 110 feet above its present elevation on Third Avenue between Stewart and Virginia. 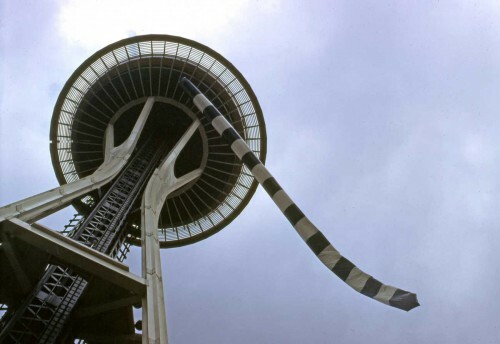 The Seattle Electric car barns and power houses with tall black stacks are evident in both views. 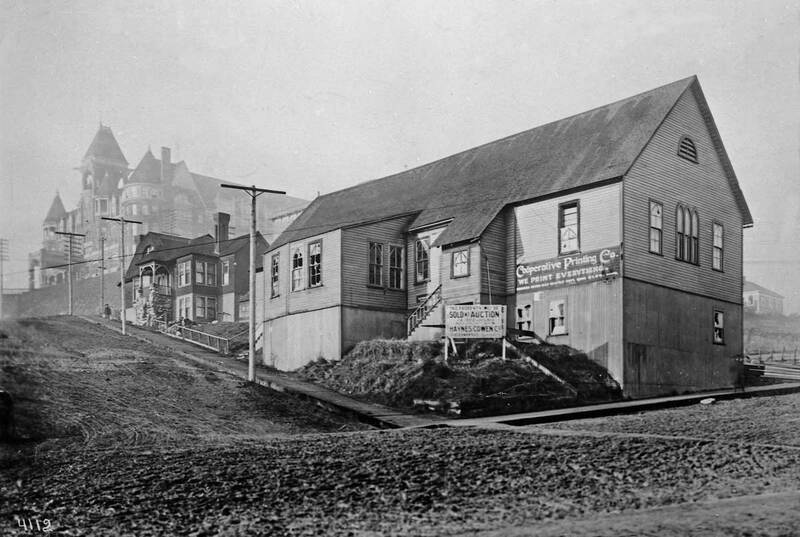 The first home for a St.Mark Episcopal – sans tower – appears with the parsonage at the bottom of the top photo, in the flat-iron block between 4th, 5th, Olive (on the right) and Stewart on the left. The steeple tops a different sanctuary, the First Swedish Baptist Church. The Pike Street dip between Capitol Hill, on the left, and First Hill, on the right, is evident on the horizon – here at its center. Graded and raised with timber supports, Terry Avenue descends one of the steeper parts of First Hill, right of center. 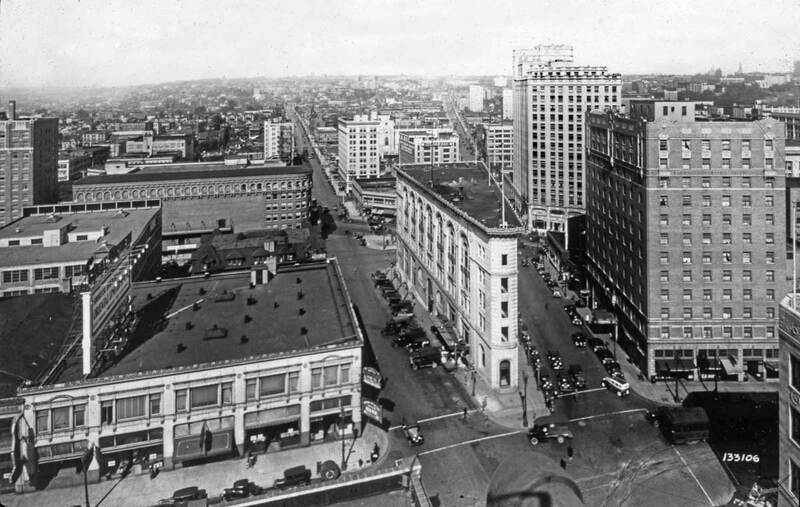 Looking west and back at the featured block with 5th Ave. at the bottom and the Hotel Mayflower across Olive Street from the Times Building. The sectioned fire escape holding to the hotel’s east facade looks very much like the Universal Worm. 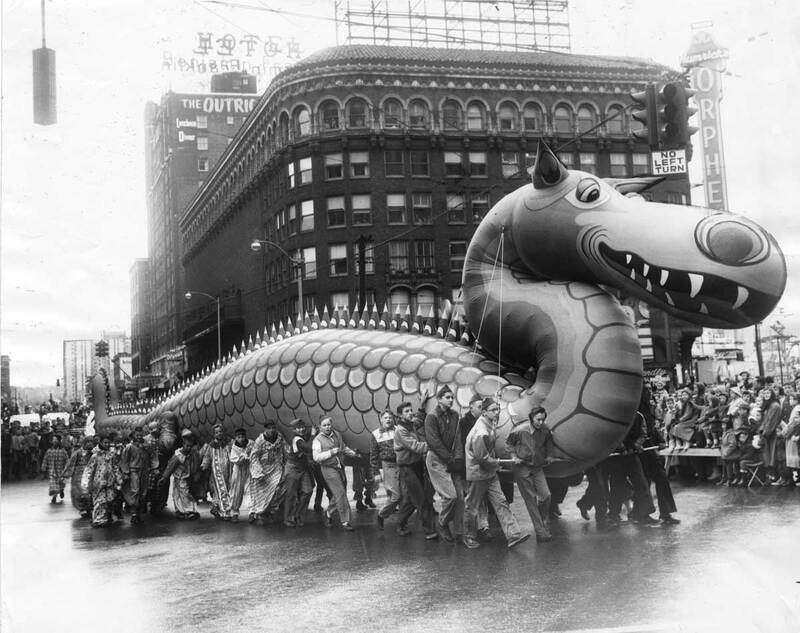 You have may have seen it before, and may see it again, the Universal Work aka Tiger’s Tale, a loving inflation by Northwest Artist John Hillding, ca. 1971. 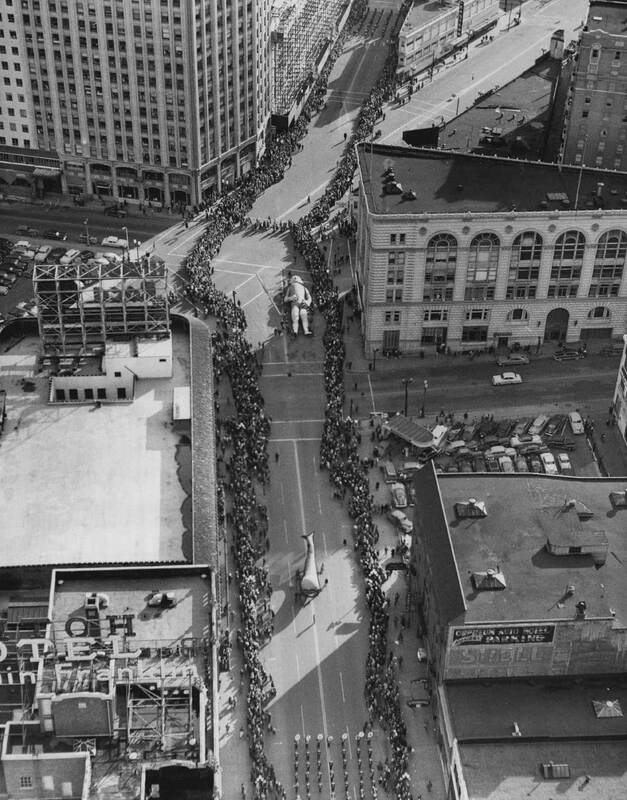 The Santa Claus Parade moves south, it seems, on 4th Avenue, with a tired big elf – perhaps – resting in front of the Times Building. A few blocks east on Olive below the Music Hall’s marque showing M.G.M.s Van Johnson vehicle, Battle Ground during its winter run here in 1950. Puget Sound Power’s headquarters at the southwest corner of Olive and 7th have corporate continuity with the Seattle Electric facilities shown above. 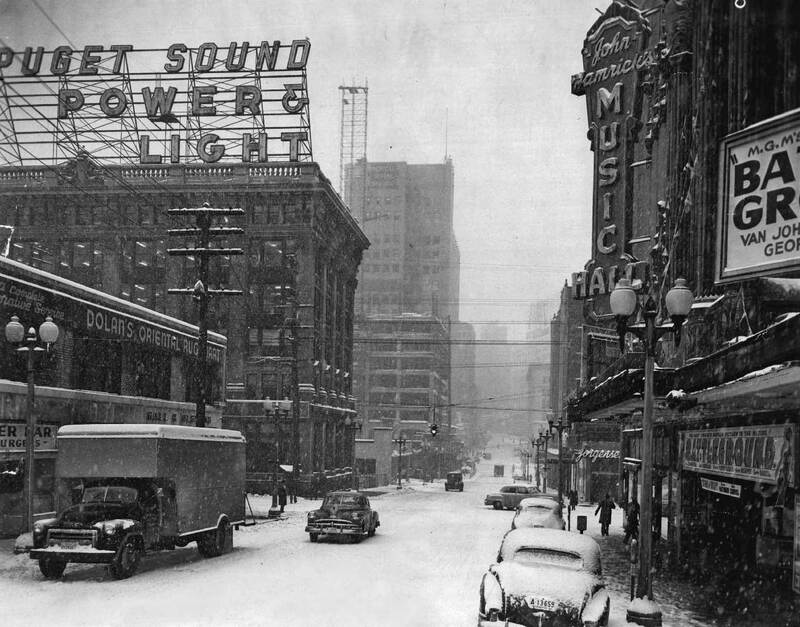 [You will find a description of the 1950 nearly Big Snow in Seattle Snows, Part Six. It can be found on the front page of this blog – as a button. One of Seattle’s hypertension centers for red meat delights, El Goucho Restaurant at 7th and Olive, ca. 1960. Imagine the abs! 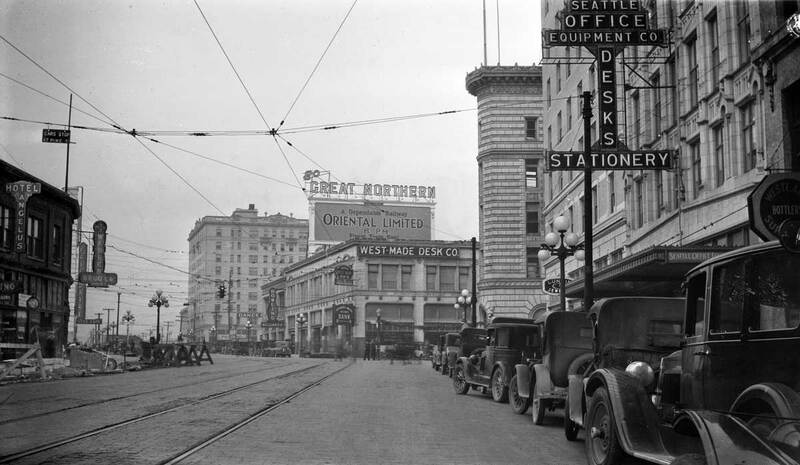 Looking north thru the same block on Nov. 29, 1927. 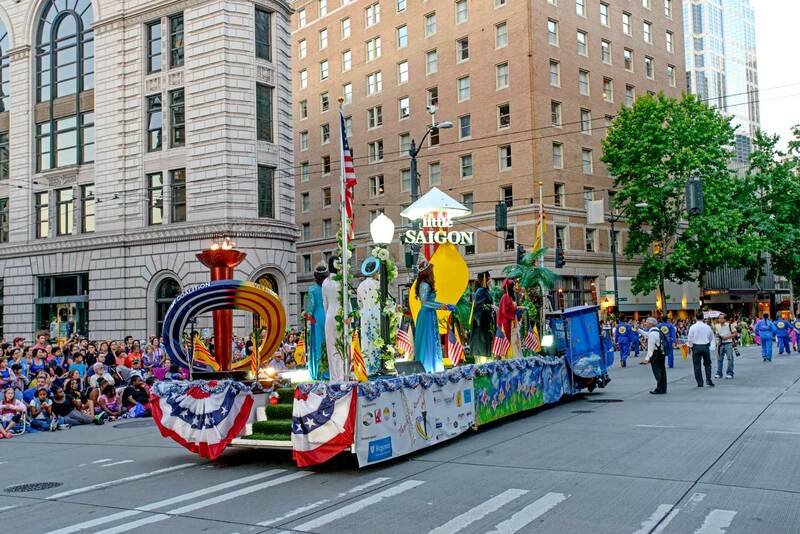 If Jean had taken the photo during the Pride Parade, he could have gotten one with the Wells Fargo coach facing north. I marched behind the coach during Pride. They cleaned up most, but not all, of the horse poop. The next time you put on a shirt with an attached collar, think of Wallace Reid, the original Arrow Shirt Man. Before the Great War, standard business attire for men included detached, heavily starched shirt collars. Matinee idol Reid appeared in print ads for Arrow, wearing their innovative new style, and the detached collar quickly faded into history. 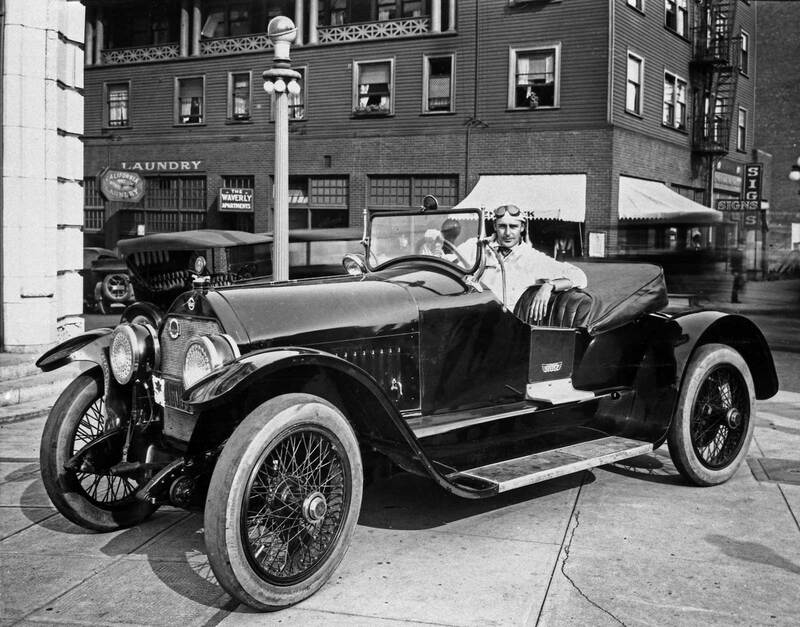 Reid starred in a number of popular road racing films such as The Roaring Road (1919), Excuse My Dust (1920) and others, so a photo in an open car is in perfect character. No doubt, Paramount carefully orchestrated every move of their valuable property.